Well, it is hard to believe that Thanksgiving 2010 has come and gone and we are now in the throws of the holiday season. I must admit, however, that I truly love this time of year. I have done very little in the way of reading and writing this week; in fact, I have not written a single word in my NaNoWriMo work all week long. I knew that this would happen, however, which is why I wrote like a mad woman the first two weeks of the month. I still have about 2,000 words to go to meet the 50,000 word challenge, and I probably have about 10,000 words to go until the end of the book. I may not finish writing the book before Tuesday night, but I will definitely achieve my goal of completing NaNoWriMo 2010. This has been a fun family week. My son came in from Nashville and we were able to celebrate with all children and their respective others. It was nice to have the Thanksgiving table full of food, family, and friends. My daughter will be spending Christmas with her in-laws in Memphis and Brian will be moving to Los Angeles in January, so this was probably the last time that we will all be together for quite a while. My youngest will graduate in May and I will become a ….ahem….grandmother in April (not sure I like the sound of that new title) so 2011 is sure to be a year of significant changes, so it was nice to have a traditional Thanksgiving weekend. Christmas time is definitely here! I did actually venture out into the Black Friday crowds around 5:00AM and when I returned home around noon I had most of the Christmas shopping completed. I still have a couple of stocking stuffers to purchase, but other than that, I am done. I am SO excited! I hope to have them all wrapped by the middle of the month so that I am not staying up late on Christmas Eve. 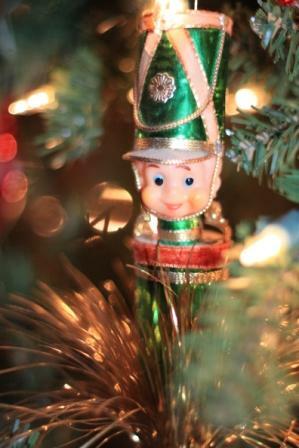 We put up the tree on Friday night and I experimented taking a few photos. I have a long way to go in my creative photography pursuits, but I am trying to give myself a break and rather than expect perfection, just enjoy the process. I am looking forward to the Picture the Holidays online photography course that will begin on Wednesday. While the next couple of weeks will be busy with end-of-the-semester grading and preparing for final exams, I hope to find a bit of time each day to focus on photography. I also hope to start reading for pleasure again. It has been far too long and I think I am ready to escape again into the world of fiction. Most of reading lately has focused on writing, and after NaNoWriMo I think I am ready to take a break from the writing routine. I still hope to maintain some kind of daily writing habit, but not at the insane pace of 50,000 words in a month. 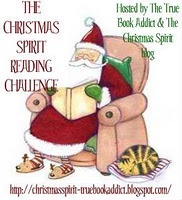 I think the Christmas Spirit Reading Challenge is the perfect antidote. I still need to cull through my bookshelves to find the perfect books. 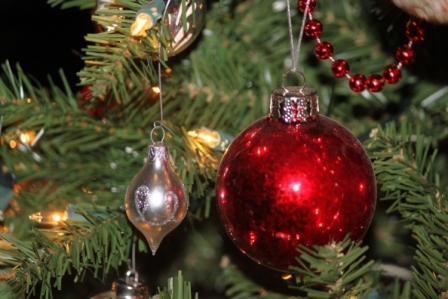 I am also looking forward to reading all the holiday themed blog posts that will be a part of the Virtual Advent Tour. I so enjoyed reading about others’ traditions last year, and I know that I will anticipate each day’s entries this year as well. In fact, I decided to take part in this tour myself and am scheduled to post on December 20th. I participated for the first time last year and gave a brief overview of our family’s Italian celebration. I am not quite sure what I will share this year, but I have some time to consider the options. This week I will have to put my nose to the grindstone. I have taken off three full days and now I need to write lesson plans and grade research papers. I hope to write all the lesson plans for the rest of the semester today and grade about six of the remaining eighteen papers. The students will be giving oral reports in class tomorrow and then I will have to complete the grading by Wednesday. I have an incentive, however, that should help me to stay focused: on Friday I will leave for Nashville for the weekend. I will have the opportunity to see my son again, my brother and his wife, and attend the Birth of Impressionism Exhibit at the Frist Museum. I have wanted to see this since I first heard about in July. 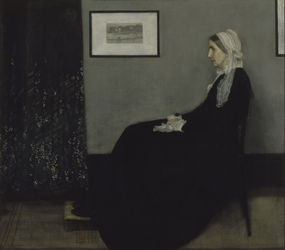 Approximately one hundred paintings from the Musee d’Orsay will be on display, and while Nashville is not Paris, this will certainly be the next best thing. I am just giddy with excitement! I hope that all of you had a wonderful Thanksgiving holiday, and that the upcoming holidays will allow you to rest, relax, and enjoy the true meaning of this Season of Hope. I am so not ready for Christmas. We won't decorate for a few weeks, but I haven't even thought about the first gift, let alone bought it. I do hope to get the photo for our card taken today. I did all my lesson plans for the rest of the semester the day before Thanksgiving. It's nice to have them done. I still have a considerable stack of papers to grade, though. Ha! Yu might not like the sound of grandma, but I now that come April, you are going to love that baby! Glad you enjoyed the Thanksgiving holiday. Change is inevitable, so we treasure those 'traditional' celebrations even more. The photographs in your post are lovely. We're hoping to get a tree this afternoon. This single blog post sent me off to sign up for the Advent schedule and to take a look at the Impressionist exhibit from the Musee d'Orsay (screaming all the while, "I went there!!!) Oh, won't you have a delightful experience there. And perhaps you can wrangle a lesson plan or two from the time there. Something that requires no time consuming grading, I hope. Is it okay for me to say I'm just a bit jealous that you're all done with your Christmas shopping???!!! Congrats on the Grandma title…I'm sure you'll love hearing it!! Oh, Molly, congratulations on becoming a grandparent. Having had our first grandchild born this past March, I can tell you this – you will love being a grandparent. I knew I would, I just didn't know how much I would. I'm just about through with Agatha Christie's Hercule Poirot's Christmas for our Christmas book group in a few weeks. It is a fast read and I am loving it, and just back from the library with two Maeve Binchey holiday fare, one short stories. Contrats on the present buying. I've but one bought, and, of course, it is for our granddaughter. sigh. I'm sure you're going to love being a grandmother – that is really very exciting! All your shopping is done? I need to get cracking! And how lovely that you had everyone together … it can be hard when everyone starts to scatter. And yay for you on NaNoWriMo. You are going to be a Grandma??? I love it! My mom says that is the best of all worlds…you get to spoil and hold a baby, but give it back at a convenient time! And way to go on your writing project. See, I knew you could do it! We have a lot of holiday shopping finished, but it's mostly thanks to my husband's efforts, not mine. What a wonderful Thanksgiving you had! Congratulations on your sterling NaNoWriMo–well done!! And are you really to be a Grandma? How exciting!! Lucky, lucky child; lucky, lucky you. Double congratulations for that! Trying this a second time … (server error)Great job on completing NaNoWriMo! I cannot imagine writing 50000 words in a month. Also, congrats on soon becoming a grandparent. It will change you forever.